In Part I of this series on creating effective sunglass displays we discussed high-end sunglass displays, all of which were some form of locking cases. In Part II of the series, we offered many examples of wood and metal material types, as well as examples of sunglass displays, accessories, and headers- all of which offer inspiration in designing sunglass fixtures. In Part III, we discussed mid-range sunglass displays and some of the key design elements necessary to create effective merchandising displays. 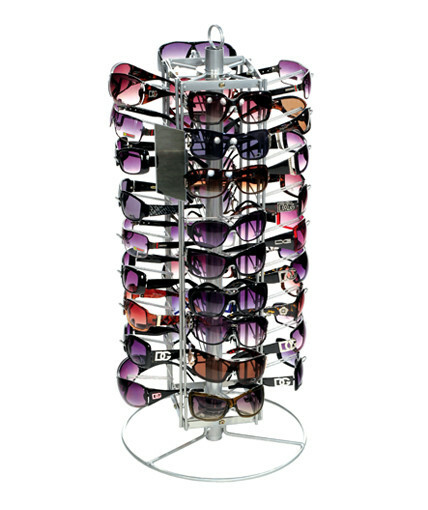 In this blogpost, we will focus on economy sunglass displays. 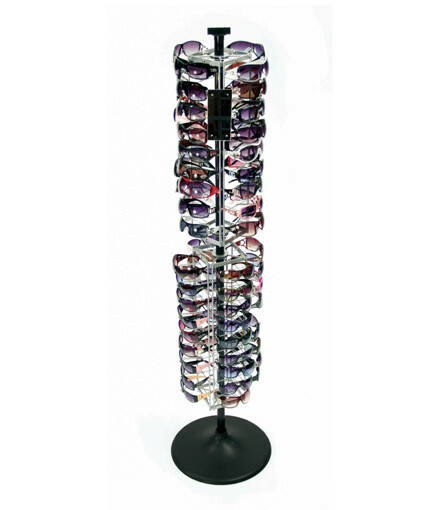 There are two types of economy sunglass displays: temporary displays and permanent displays. Both types of displays can take the form of floor displays or counter displays. Let’s take a brief look at both types. As with other temporary displays, temporary sunglass displays are generally made of corrugated material and are often fully or partially covered in graphics. Temporary displays are generally less expensive than permanent displays, particularly at higher quantities. But, they also tend to be used primarily for in-and-out programs, promotions, or new product introductions. As a result they are not in the stores very long- usually just long enough to sell through the initial inventory on the display. 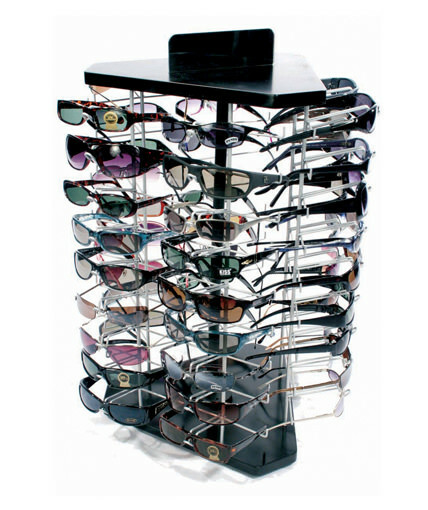 That means for a typical counter sunglass display for example, the cost of the display needs to be amortized over, let’s say, 24 pairs of glasses. Temporary displays don’t lock in permanent retail space and can be expensive since the display may need to be replaced if the sunglass supplier desires to sell more glasses in a particular retail location. In addition, at low quantities such as 100 or 250 units, temporary displays tend to be relatively expensive, especially the well-branded ones with a lot of graphics. 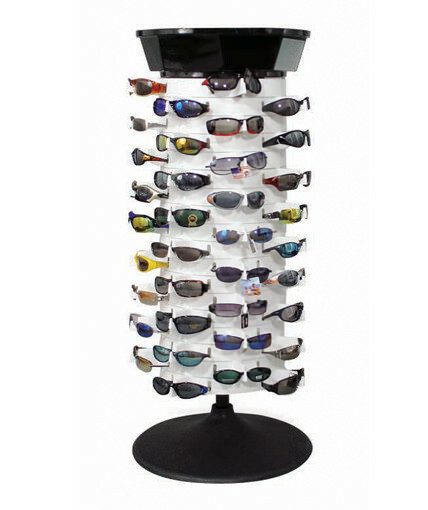 Temporary sunglass displays can offer most of the same functionality as a permanent display. With a good plastic bearing, they can spin nicely, and they can easily accommodate an acrylic mirror, which is a fairly cost-effective addition. The two most common ways of “hanging” sunglasses on a temporary display are using a corrugated nose piece or no nose piece at all. There are different styles of corrugated nose pieces, but most of them are similar. Neither method does a great job of showing the full sides of the glasses, but the method with the corrugated nose pieces tends to show a bit more of the temple of the sunglass. One example is shown below. 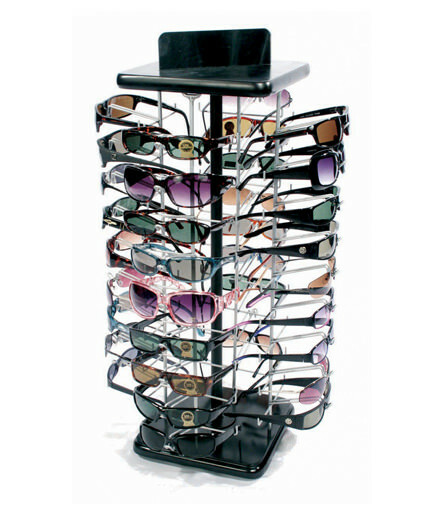 Several examples of other corrugated sunglass displays are shown below. 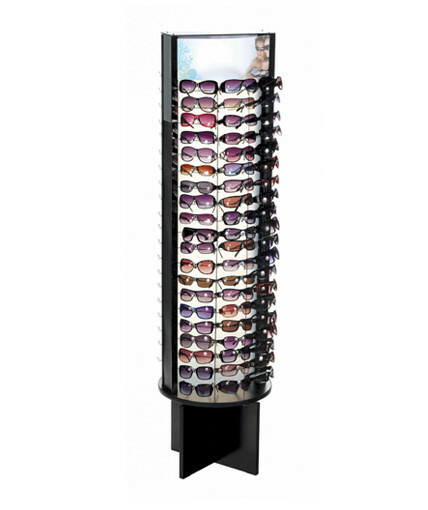 A. SUF and SUC Series- The SUF and SUC units are adjustable floor and counter sunglass displays constructed of injection molded rings that snap together in a variety of configurations depending on the number of sunglasses to be displayed. These merchandisers includes an injection molded plastic base, a center pole, and vacuum formed plastic header with mirrors. B. SCWI-36 and SFWI-72- These two stock spinning displays are good examples of economy wire sunglass displays that are constructed using knock-down wire panels, a center pole, acrylic mirror, plastic or wire sign holder, and an injection molded plastic or wire base. C. SU-36KD and SU-54KD- These stock economy spinning counter sunglass displays combine wire grids, a metal center pole, a PU coated MDF base and top, and a 2-sided acrylic mirror. 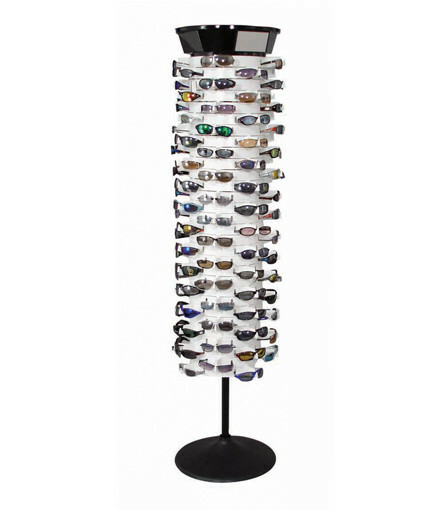 D. SU-120-2S- This 2-sided spinning floor display is another example of an economy sunglass rack from our line of stock displays. This unit holds 120 glasses and features an easy-to-assemble knock-down display. The SU-120-2S features a customizable header sign, side graphic channels, frosted center panel, 2 acrylic mirrors, and a black frame and base.